Air leaks can occur around electrical boxes in exterior walls and ceilings, sometimes carrying water vapor that can condense in the wall and attic cavity, leading to rotting, mold growth and an increased heating and air conditioning load. 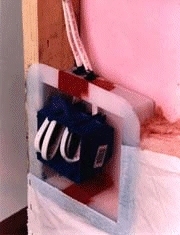 This LESSCO Air Vapor Barrier Box is designed to attach to a wall or ceiling frame and can contain up to 3 conventional electrical boxes. Once installed, use silicon sealant or low-expansion foam to seal the box where the wires pass through into the wall cavity and tape the vapor barrier to the box flange with contractor's sheathing tape, eliminating air and moisture leaks. Box interior is 6.5" x 7.5" x 2.9" deep and features LESSCO's patented hinge feature.